This unit is a perfect companion to the novel " Charlotte's Web"! 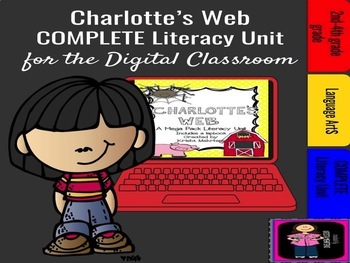 It comes with everything you need for an innovative and engaging way for your students to practice their reading skills while reading the novel " Charlotte's Web". WORD WORK activity that can be duplicated to use with as many vocabulary words with the novel as you like. 3. A VOCABULARY CHOICE BOARD- with clickable web links to create memes, comic strips, crossword puzzle, Voice recordings, Videos, and Drawings that go with any vocabulary word from the novel unit. 4. A DIGITAL RESEARCH FARM PROJECT- This includes clickable web links to different links about a variety of kinds of farms. Students choose one to research. It also includes a research recording page to type in their findings. Also included are 4 pre-made GOOGLE SLIDES for students to record their information with pictures for a class presentation on their farm. 5. A 7 page STORY ELEMENT student activity. It includes slides over the 5 story elements. 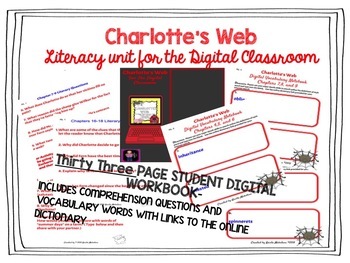 Also included is student digital activities to record the story elements of Charlotte's Web. 6. a 4 page CHARACTER TRAITS SLIDE and STUDENT ACTIVITY- 2 slides are instructional that go over character traits and traits that can be seen and then those that are inferred through actions and dialogue. 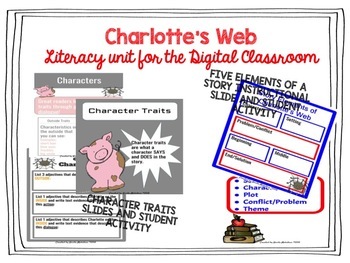 Also included is a student digital character activity on Charlotte and Wilbur. 7. 2 page SUMMARIZING SLIDE AND STUDENT ACTIVITY- This comes with an instructional slide on summarizing. 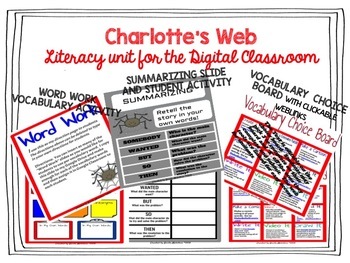 Also included is a student digital slide on summarizing Charlotte's Web. 8. A CHARLOTTE'S WEB ASSESSMENT is also included. This DIGITAL UNIT COVERS SO MANY SKILLS: Summarizing, character traits, Story Elements, Vocabulary, and Comprehension. Your students will love the digital components of this unit!